At RON RUFF ROOFING our mission is all employees are dedicated to helping you complete your roofing project in a timely, cost effective way. We strive to provide products and services that are energy and earth friendly which upgrade your home’s appeal and value. Your home, after all, is your number one investment! Ron Ruff Roofing, Inc./Ruff Roofing is located in Baltimore, MD. serving Maryland, as a professional roofing contractor specializing in commercial, and residential roofing installations as well as maintenance and repair of existing roof systems. 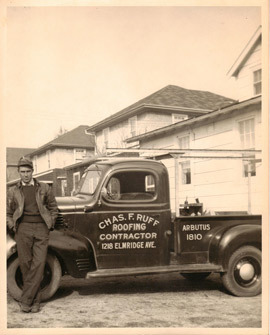 Ron Ruff Roofing is a family owned and operated business since 1939. We have been repairing and installing roofs for over 70 years everywhere from single family homes thru high rise buildings. Ron Ruff Roofing is a certified applicator for most roofing manufactures, in shingle roofing, single ply roofing, and modified roofing system. Ron Ruff Roofing is fully licensed insured and bonded, and has been roofing Maryland for the last 70 years, a reputation for the highest quality craftsmanship, honesty, as well as integrity. Our current business success also is due to referrals and repeat business from our previous customers. With all estimates given by Ron Ruff Roofing, the customer is supplied with a Glossary of Roofing Terms as well as a “Contractor Advisory” As you read through this web site you will see that a roof is not just a roof. A roof consists of different materials and all estimates are not created equal. The same applies for roofing contractors. There are Roofing Contractors and then there is Ron Ruff Roofing, keeping customers satisfied and their investment assets secure and most important, water tight for over 70 years!